This is a picture of me on my first trip to Paris in March 2008. It's not the greatest quality, but to me, it speaks volumes. 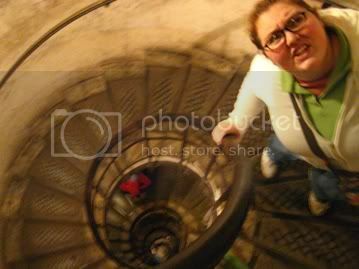 My friend Jill took it in the stairs leading to the top of the Arc de Triomphe. One giant spiral staircase all the way up, almost 250 steps. It was the first thing we did after getting settled at our hotel, and let me tell you, the excitement of being in Paris for the first time wore off after about 50 steps. I'm not sure what I weighed there, but it was surely over 300 pounds. Climbing those stairs, my legs ached. My lungs ached. I felt like the guy who collapsed during the Iron Man Challenge - all wobbly and unable to move. I pushed myself and pushed myself and finally made it to the top, huffing and puffing and needing to sit, or else it felt like I would fall. I was fairly certain I would die in my hotel room that night from overexerting my lazy body. I was thinking about this on Sunday when I was doing my stairathon training. When I decided to do the stairs (three weeks or so ago), I said it was about completion and not racing to the top, though I unofficially wanted to finish in an hour. I hoped and prayed an hour would be enough. And I kept thinking about climbing the Arc, and how long it took, and how much it hurt. Sunday was the last day of doing 10 floors (20 flights, 180 steps), and the first time I timed myself. I stopped about every four flights for maybe 15 seconds to just breathe, then I continue. And when I finished, I caught my breath in under two minutes. Breathing is my main issue with the stairs - my legs don't hurt, at least not the way they did in the Arc. They have the healthy workout burn feeling, but nothing painful, no discomfort. I still have a lot of training to go - yesterday I started doing 12 floors, and I will gradually increase up until the 10th when I do the full 26 (about 468 steps). But it feels great to know that I'm pushing myself to do something and the rewards will be incredible. I'll feel great physically, I'll feel fantastic emotionally, and I'll know that next time I'm in Paris, the Arc de Triomphe will no longer be the same challenge it was back in 2008.